Sortimo have 33 years of experience as Europe’s largest manufacturer, supplier of innovative secure van racking equipment. Globelyst is the new and revolutionary third generation in-vehicle equipment, which uses a Space-Frame technique that offers a weight saving system with greater flexibility and variety. 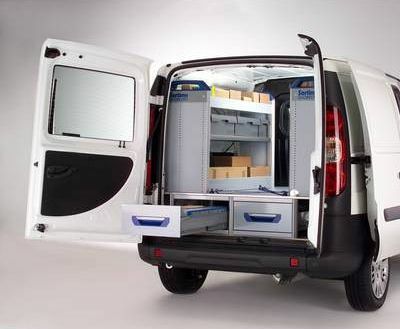 The Sortimo product portfolio consists of over 1,000 high quality van racking modules, all of which have been designed for installation into any type of commercial vehicle, from car-derived vans to large panel vans. Sortimo systems are made from lightweight materials to ensure that maximum usable payload is retained. The Sortimo product range includes 100% extension drawer systems, high quality service cases, high visibility van shelving systems, lockers, workbenches, and many accessories for the complete solution. As a Sortimo Agent, Cafco can supply and fit any of their products for your purposes. Just choose from our list in the sub menu.